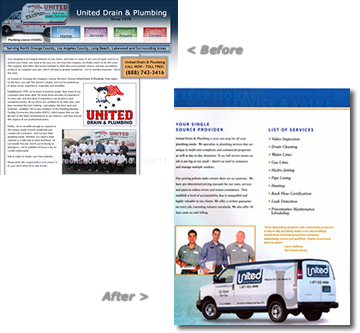 United Drain has been in business nearly three decades and, as a result of increased competition, hired 3media to update their look and feel. This included direct sales assistance, a complete re-branding (logo, collateral material, truck wraps et al), ad campaigns and general business know-how to help United grow and become increasingly efficient thereby enhancing profitability. 3media also assisted United to position themselves in the marketplace to increase market share by broadening their target markets and identifying key prospects via direct e-mail campaigns. A professional yet not too stiff look was successful in enhancing their brand perception in the markets they serve which aided in attracting larger corporate clientele.